Berkeley, CA â€“ 8 December 2011 â€“ What if the union of a generation’s brightest minds like Albert Einstein and Robert Oppenheimer was not a signal for optimism, but foreboding? What if everythingâ€¦ went wrong? In the year 1945, the atomic bomb proved its capacity for immense devastation, but what if the creation of that ultimate killing machine was just a cover for a series of other, more unusual, programs? A brand new, monthly ongoing series from Image Comics will pose that question by taking a look at one of the most critical periods of change in the 20th century through a lens both darkened and strange. Join us, for what is poised to the breakout hit of 2012, THE MANHATTAN PROJECTS! 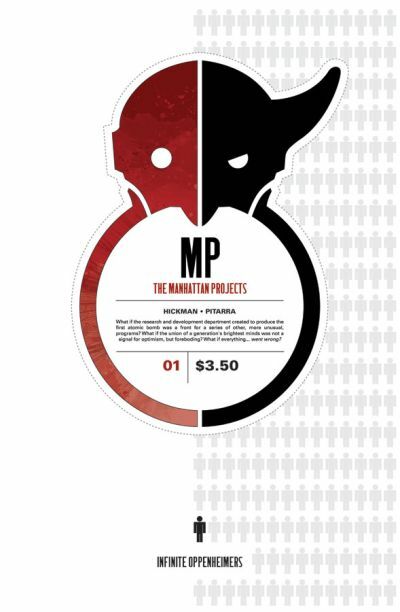 Award-winning writer Jonathan Hickman (THE NIGHTLY NEWS, FF) and one of the best new talents to debut in comics during the last year, Nick Pitarra, are teaming up once again to present THE MANHATTAN PROJECTS. Following the completion of their critically acclaimed science fiction success, THE RED WING, the duo are taking the cautionary aspect of science fiction and applying it not to the future, but to our past! THE MANHATTAN PROJECTS #1, a 32-page full-color science fiction comic book for $3.50, will be on sale in stores on March 7 and available for order in the January issue of Previews. In the mean time, both THE RED WING TP (OCT11047, ISBN: 978-1-60706-479-4), a 144-page full-color trade paperback for $14.99, & THE NIGHTLY NEWS ANNIVERSARY EDITION HC (SEP110423, ISBN: 9978-1-60706-4619), a 272-page full-color hardcover graphic novel for $34.99, will be on sale in stores December 14.